Our time in Zalakaros came and went so quickly! It feels like we’ve been here forever (just over a week) but we haven’t been able to do so much. It’s weird when I’m explaining to our non chess playing friends what your schedule is like when you are playing a tournament. They really can’t believe games can stretch for hours or that all I ever tend to see is the hotel. 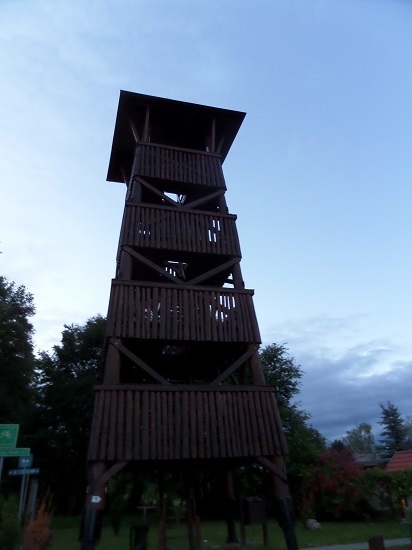 We managed to go cycling one evening when we both finished early and we explored the town (which isn’t very big). We started by going around the back of the hotel where we found streets lined with pretty houses. Nearly all of the houses were empty (guess this place is a resort town) and filled with signs in the front yard saying “Frei Zimmer”. It was getting dark and we had hired the bike for a hour and we didn’t really know where we were going. We saw a sign for “Kilátó 2.4km” so decided to cycle there. Where was “there” we didn’t know, but all of a sudden we hit a hill which I couldn’t cycle up. The bikes were quite rusty and I got distracted by a basset hound who was out with his owner! I ended up walking up the hill (Gawain was way ahead of me) and eventually we saw Kilátó which was a tower next to a pub. I decided we should climb up it (seeing as we haven’t done anything touristy in Zalakaros) and after 10 seconds up we climbed back down. We then took a windy road downhill and boy it was steep. We passed several German tourists (you could mistake this place for being in Germany as probably 70% of the people here are from there). We then got to a crossroad and we nearly cycled out of town! Lucky for G, I’ve got quite a good map memory and quickly realised that was the way we came in from Budapest. I’ve finished the tournament on 3.5/9 and I’m gaining 19.4 points. Overall it was a success though there were definitely some ropey games. I didn’t really have a “smooth game” this tournament which was a pity. I guess my nicest game was once I got this endgame against FM 2380 but even then I still made some mistakes. I didn’t know if my rook and pawn endgame was winning (it is) as I was confused about how to make progress with King on g8, pawn on g7 but I managed to “build the bridge” another way. “Cute” Ga called it! I’m now running at 2174 and will play twice before the Olympiad. We will go to Lucca (one of Gawain’s hometowns) in the middle of June where we will play in the Lucca Open and then I’ll head to Ikaros in Greece. Gawain will accompany me for a holiday. I’m feeling good about my chess but after my opening with FM Gergerly Kantor I was mentally beating myself up. My position was not so bad – but it felt pretty crappy and with white too! At least I have some things to work on in my game and it’ll be another push to get it to the 2300 level. Zalakaros is a nice town. The weather was lovely for half a week and great for May and we have enjoyed our time here. I think it would be a bit lonely if you came alone (unless you spoke Hungarian or German). 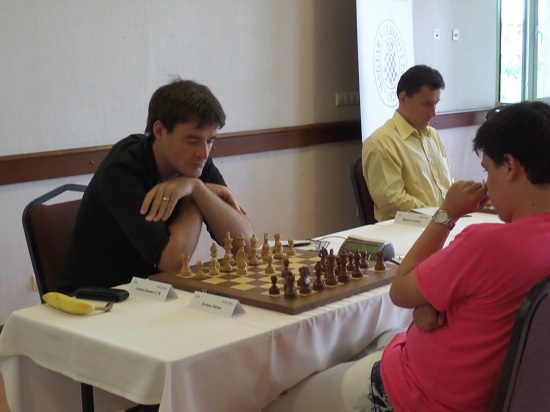 The 33rd Zalakaros Open tripled up as the Gyula Sax Memorial and the Hungarian Championships. It is also a tournament which will help the Hungarian selectors make their choice for the Olympiad together with a 6 board match they will have against Poland. In Hungary, I see there are loads of young strong kids! I guess the chess culture is still very strong here.